Ok, you spent an hour at your Vendor Accountability Summit communicating the situation your company is in. Your vendor partners took diligent notes. Now, you're going to share with your vendor partners how they will be evaluated in the upcoming year. Your goals and objectives are split three ways ... profit ... new + reactivated buyers ... and winning new items. This means that you must evaluate your vendor partners via the same objectives. You have no choice, folks. If you want to be successful, and your employees are aligned along these objectives, then you must hold your vendor partners accountable as well. In the Vendor / Partner Dashboard, I have one row for each vendor. Then, there is a column for each objective that is important to me. I give my three key objectives equal weighting ... 20% for profitability ... 20% for new + reactivated customers ... 20% for winning new items. Then, I add two objectives, objectives that are important to me ... customer service (at 30%), and innovation (at 10%). In other words, my vendors are going to be evaluated at 60% on my goals, 30% on customer service, and 10% on the innovation they bring to the table. Vendor goals are aligned with my goals. Then, I give extra credit to organizations that provide outstanding customer service, and I give extra credit to organizations that promote smart innovation. Innovation is going to be a tricky one. I don't want to reward vendors who tell me to "be omnichannel", or recommend that I "personalize or die". In fact, if this is the advice I get, well, I'm going to hammer the vendor on the innovation score. I don't want to see vapid innovation, and I don't want to see innovation that is aligned with innovation that generates profit for the vendor. I want to see truly innovative ideas. 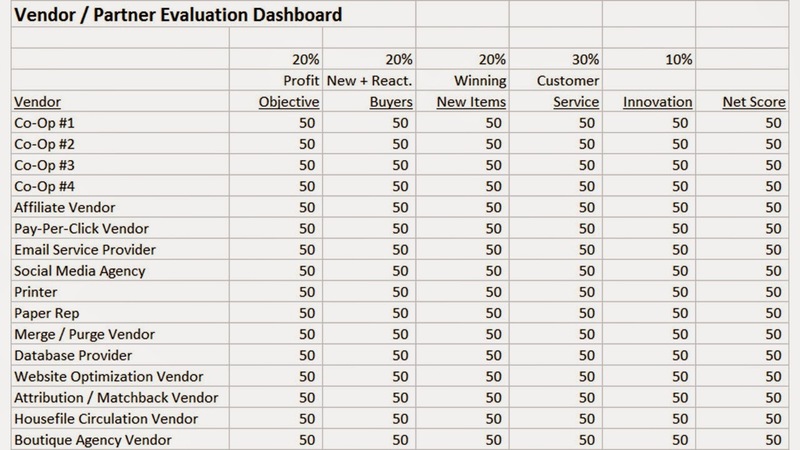 Each month, I will evaluate my vendors on the criteria in the table above. I will rank my vendors from best performing to worst performance. I will share the results with my vendors. Every vendor will know where the stand. Tomorrow, we'll shift the conversation from what I demand of the vendor team to evaluation of each vendor.